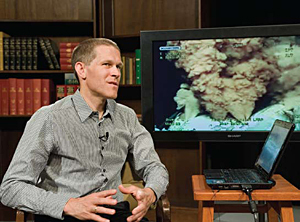 Flow Analyst: Purdue mechanical engineering professor Steven Wereley analyzes a video clip of the oil well leak in the Gulf of Mexico. When Steven Wereley, professor of mechanical engineering, helped spill the truth about the BP oil spill off the coast of Louisiana, a perfect media storm dropped right into his life. Had National Public Radio not called to ask him to analyze video footage of the gushing crude, Wereley may have lived out the rest of his career quietly researching fluid mechanics on microscopic scales. Instead things ballooned into super-scale proportions. Invitations to Washington, D.C., for a congressional hearing and to be part of an expert task force soon followed, as did his appearance in some 15,000 media outlets. A team of scientists and engineers, including Wereley, released figures in late May showing that at least 12,000 to 19,000 barrels of oil were still flowing daily into the Gulf of Mexico in the aftermath of an April 20 oil rig explosion. That meant the BP PLC oil spill off the coast of Louisiana had already surpassed the Exxon Valdez as the worst in U.S. history, according to the U.S. Geological Survey. 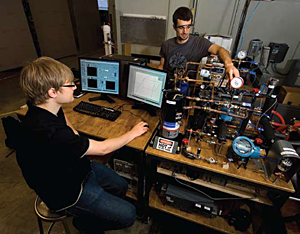 Heat Sensors: Frederick Welck, at left, an intern from Institut fr Technische Chemie in Clausthal-Zellerfeld, Germany, and mechanical engineering doctoral student Christian Bach work with an experimental setup for testing valves as part of research led by Purdue to develop more efficient heat pumps. A new type of heat pump being developed at Purdue could allow residents in cold climates to cut their heating bills in half. The research, funded by the U.S. Department of Energy, builds on previous work that began about five years ago at Purdue’s Ray W. Herrick Laboratories, says James Braun, professor of mechanical engineering. Heat pumps provide heating in winter and cooling in summer but are not efficient in extreme cold climates, such as Minneapolis winters. “With this technology we can maintain the efficiency of the heat pump even when it gets pretty cold outside,” says Eckhard Groll, professor of mechanical engineering, who is working on the project with Braun and W. Travis Horton, assistant professor of civil engineering. The innovation aims to improve efficiency in general but is especially practical for boosting performance in cold climates. The new heat pumps might be half as expensive to operate as heating technologies now used in cold regions where natural gas is unavailable and residents rely on electric heaters and liquid propane. Mechanical Woodworkers: Mechanical engineering students Erik Cowans and Mackenzie McNamara (BSME 10) sit in the uncovered cab of a new multipurpose vehicle designed and built by Purdue students, as John Lumkes, assistant professor of agricultural and biological engineering, stands by the bed. 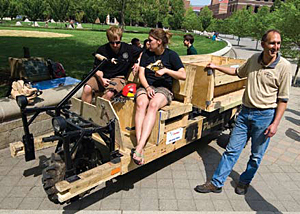 Purdue students designed and built a multipurpose vehicle made primarily from wood and traveled to Africa to help officials there set up a manufacturing facility for the trucks, which could help to transport everything from produce to people. The Basic Utility Vehicle, or BUV, is produced from raw materials readily and affordably available in Africa and is designed specifically to meet the needs of villagers. The students traveled to Cameroon, Africa, in May to aid in setting up a manufacturing facility in a northern village near a forest. The BUV’s body and much of the frame are built of pine, but the design can easily be adapted to African hardwoods like mahogany or eucalyptus. It could be used for many purposes — such as hauling crops, water, building materials, students or the infirm — in areas where no other transportation exists, says Kyle Bazur (BSME ’10). The students won an innovation award for the vehicle during an April competition sponsored by the Indianapolis-based Institute for Affordable Transportation, which is promoting the use of BUVs to help people in poor regions of the world. In late June, the University of California, Merced named Daniel Hirleman, the William E. and Florence E. Perry Head and Professor of Mechanical Engineering at Purdue, the dean of its School of Engineering. “We extend our thanks to Dan for all that he has done for mechanical engineering, the College of Engineering, Global Engineering Programs, and Purdue, and we congratulate him on this next major step in his career,” says Leah Jamieson, the John A. Edwardson Dean of Engineering.